Keeping your smartphone charged is a challenge in everyday life, and it's even worse when you're traveling. Long days in transit or out exploring a new city make the battery icon start flashing before you know it, especially when you're relying on your phone for navigation, entertainment, and more. If that wasn't bad enough, you've usually only got a few precious minutes to get some juice in it—a short layover, coffee break in a café, or quick return to the hotel to freshen up—before you're out of reach of a charging cable for another few hours. Fortunately, there are a few things you can do to help speed up the charging process. Check out these five simple hacks for getting more juice in your phone when you're short on time. Always charge from a wall socket rather than a laptop when you're in a hurry. It takes longer—in some cases, an extra hour or more—to charge a smartphone via USB than doing it from the wall. If your charging cable didn't come with an adapter to plug it into the wall, they're small and cost as little as $10 for a good one. You can even buy combination wall chargers and portable batteries, which charge your phone first and the battery second. That way, you've always got power (and a charger) when you need it, and they're about the same price as buying both things separately. Speaking of good USB wall chargers, be sure to use one that can put out as much power as your smartphone can handle. For example, the iPhone 7 ships with its own wall adapter, but can also handle the 10W and 12W chargers that come with iPads just fine, and will charge much faster if you use one. By contrast, if you use an old, low-power USB adapter you happen to have lying around, your phone will charge extremely slowly, or might not even charge at all. You can't damage your phone by doing this—the number on the adapter is a maximum rating, but it will only send as much power as your device actually requests. If your phone supports quick charging, make sure the wall charger you're using does as well. Most phones with this capability will ship with the right kind of charger, but not all do, so check the specifications carefully. It makes a huge difference! In summary: check the specifications of the adapter you're planning to use, and buy a better one if you need to. The substantial time saving is well worth the small extra cost. 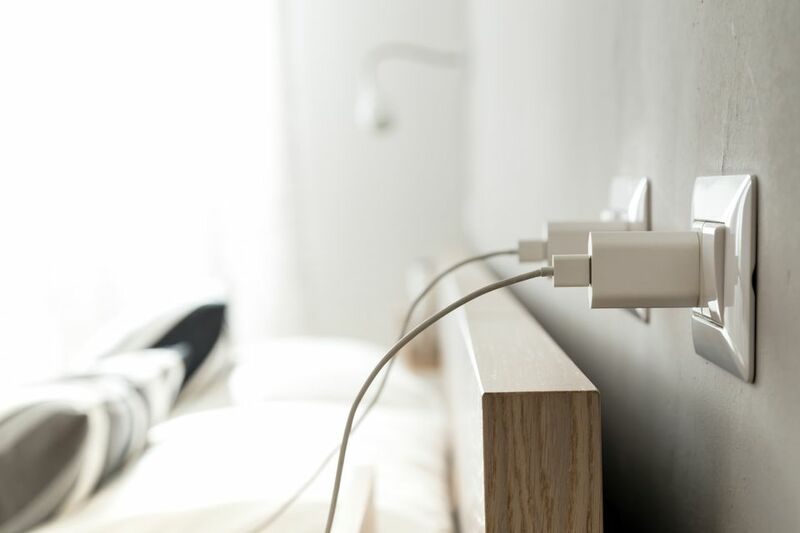 While most current smartphones will charge faster from a higher-power USB charger as above, some also support an official fast-charging standard. The most common at the moment is Qualcomm's QuickCharge (QC) 3.0. To avoid the risk of over-charging and damaging batteries, most chargers dramatically slow down the charging rate as the device on the other end approaches 100%. If the phone and charger both support the QC standard, however, they'll alter the voltage based on exactly what the phone battery can handle at that moment. The end result? Faster charging, especially towards the end of the charging cycle. To take advantage of this, check whether your phone model supports one of the QC standards, then make sure you're using a charger that also supports that same standard. The original charger that came with your phone usually will, or you can buy replacements from most major electronics retailers. Certain portable battery packs can charge much faster than the smartphone or tablet you'll be connecting them to. The Lumopack, for instance, boasts of being able to store enough charge in six minutes to fully charge an iPhone 6S. Completely charged in just 18 minutes, it'll then have enough juice to recharge that same iPhone two or three times. Just plug the battery into the wall while you're waiting to board or taking a shower, then slip it into your pocket when you're done. Once you're buckled into your seat or walking out the door, just connect it to your phone and start charging it back up at normal speed. All of those useful features on your smartphone chew up battery life, but the Wi-fi and (especially) cellular radios are one of the biggest power hogs of all. To make sure you get as much juice as possible into your phone when you're in a hurry, put it in flight mode while you're charging. If you're waiting for a call or text, at least turn off mobile data and Wifi to save a little battery. The only thing that kills your battery faster than cell data is that big, bright screen, so stop looking at it while you're charging the phone! Every little bit helps, and continually turning on the display to check the battery percentage is only going to make matters worse. If you really can't resist checking, at least turn the brightness down as low as you can while still being able to see the screen.